The South African climate warmly embraces an outdoor lifestyle and there is a growing trend to create seamless interior/exterior environments that allow homeowners to take full advantage of the country’s natural beauty. 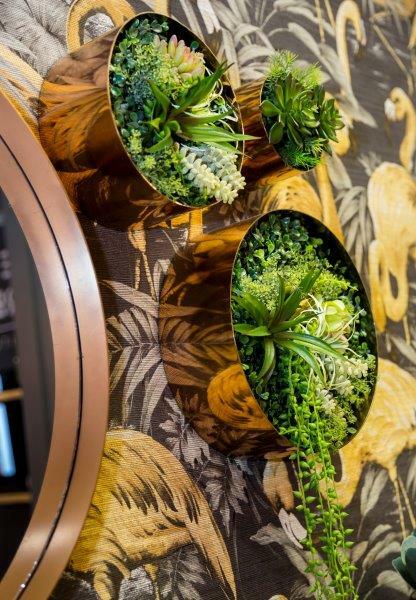 The innovative décor, design and lifestyle products stylised for outdoor living will showcase at the 2019 Decorex exhibitions – Decorex Durban, Decorex Cape Town and Decorex Joburg. “The need to maintain human connections in the digital age has greatly influenced the design of outdoor living spaces. A simple patio and weatherproof furniture just won’t do the trick anymore, says Anita Bloom, Creative Director of Decorex SA. People want an outdoor sanctuary to connect with family and friends that reflects or even exceeds the comfort of our indoor living spaces. Take the contemporary design outdoors, with clean lines incorporating textures with monochromatic colour schemes with pops of colour. Decorex SA welcomes a number of experts in outdoor living to all three Decorex SA exhibitions, including Mobelli Furniture + Living, All Hand Done, Designer Pool Covers, Keith Hamilton and Patio Warehouse. This follows on from the recent indoor-outdoor trend that seeks to create a home space outdoors. This can be done be picking up accent colours from your inside living space and introducing that colour palette into your outdoor area with scatter cushions, throws, rugs and décor accessories. This will soften the outdoor space and create a harmonious flow throughout your home. There is nothing quite as South African as a braai, but we are looking for something that is both functional and aesthetically appealing to suit the outdoor entertainment area. The trend for multi-functional and aesthetically appealing outdoor entertainment areas has grown. Keith Hamilton provides a really beautiful range of artisanal outdoor fireplaces that strike the balance between form and function. Zoning is a popular trend right now that will certainly extend into 2019. Just as you would create zones inside the home, the outdoor space can also be set into key zones for lounging and dining – rather than just one space for everything. A great way to demarcate and define the different spaces is through the use of rugs. Rather than the traditional net pool covering, there is an emerging trend of installing more visually appealing pool covers that have the associated safety benefits as well. Designer Pool Covers anticipate the newly-launched decking system to trend in the upcoming season because of the various benefits, such as a reduction in water evaporation, decreased chlorination and electricity use as well as low maintenance capabilities. The sliding or decking system also means that you can use the space above the pool during the colder months. Transforming furniture and transforming furniture compositions will be a trend in 2019. Furniture which adapts to our lifestyle, as well as furniture suitable for smaller urban living spaces, will prevail. This trend is also about being a co-creator of your own space as you build the furniture pieces to suit your current needs and adapt as you change or develop. Modular furniture, such as the latest Switch outdoor lounge set from Mobelli Furniture + Living, allows you to add or move chair backs and side tables as you need to. You can also add on elements, modular chairs and ottomans. Everyone is searching for a sense of freedom, whether it’s at home, with friends or camping outdoors – but this needs to be done in style. Fortunately, there is now every manner of outdoor furniture and accessory to make the outdoors feel like home – sun loungers, bar stools, hanging chairs, day beds and recliners – everything to enjoy the outdoors in comfort. The chalky, earthy tones of anthracite is set to be the most popular colour trend for outdoor furniture going into 2019. This can be seen in sun loungers, dining tables and chairs, as well as drinks trolleys and accessories. The patio is considered an extension of the home but the furniture will experience more weathering than indoors. There are now various ranges of outdoor furniture available, upholstered in a fabric that will withstand outdoor use year-round. They are crafted using breathable, quick-dry materials that allow constant air circulation. The UV, stain and mould resistance means a fresh, new look throughout the seasons. Although quilted designs have been around for the indoor living space for some time now, they are only now emerging as a trend in outdoor living areas. Look out for quilted designs in upholstered furniture and scatter cushions in 2019. Next: Diarise the dates for Decorex Durban now! The dynamic shutter company, Plantation Shutters, has always thrived on the latest trends and remaining a step ahead, so when they needed to build a new exhibition stand, they put their heads together to create something completely unique. Having always loved interacting with homeowners, designers and architects at the many expos held around South Africa every year, they have looked for innovative ways to showcase their premium shutters. It wasn’t until the Plantation Shutters team met Herman and Clifford Hoffman of Container Rental and Sales that their dream became a reality. Under the guidance of Sam Lurie from Sprout Design, they designed a trendy, funky and utterly gorgeous pod from a repurposed utilitarian high-cube shipping container that’s 6m long, 2,4m wide and extra tall at 2,89m. 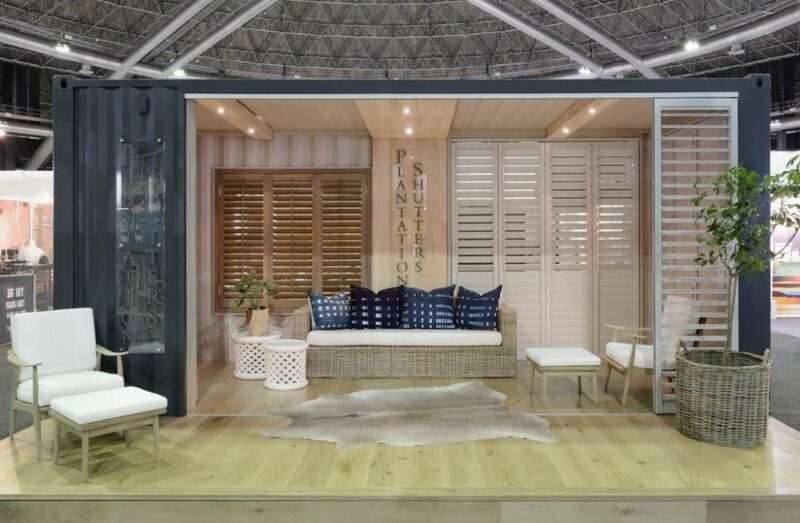 Plantation Shutters’ first exhibit at JHB Homemakers Expo in February incited a huge amount of interest from the public including one visitor wanting to buy the container “as it was” as a gin bar for his upmarket home. • Yvonne O’Brien – The Private House Co.
Our country is well-known for its sunshine. Joburg, in particular, offers one of the best climates, the summer days are warm and the winter days are crisp and clear. Winter is upon us, the temperate has dropped, but it shouldn’t keep you from enjoying the outdoors in the city of Joburg this winter. The winter weather – often cold with very little sunshine – may make even the most “outdoorsy” people want to stay indoors. But, we all know the importance and benefits of being outdoors. 1. Do your exercise outside. Whether it’s a walk or a jog, as long as you wear layers of clothing and protect your skin, you can definitely exercise outside. Looking for a great location? Visit the James and Ethel Gray Park on Atholl Oaklands Road. This park is home to an assortment of feathered residents. The Sandspruit River flows through its 36 hectares, creating an attractive, tranquil atmosphere. Alternatively, visit Golden Harvest Park. Located on First Avenue, Northgate, this park is immaculate and features rolling walks around a dam and indigenous bushveld. The scenic park is a secret treasure about which many are unaware. 2. Watch wildlife. You may have heard it before, but there is no better time to enjoy animal life than in winter. The bushes thin out and lose colour, improving visibility considerably. Visit the Rietfontein Nature Reserve with your partner or family. It is the home of the FreeMe Wildlife Rehabilitation Centre, boasts a circular walking trail that is well maintained and is the perfect spot to sight the myriad of birds here. If you’re based in Roodepoort, Kloofendal, a cultural heritage, and ecotourism facility is one of the first nature reserves in Joburg and offers a great escape from city life. The reserve has remains of early gold mining activities and is recognised as the first gold mine in Johannesburg. This reserve is home to a number of small mammals such as reebuck and dassie. 3. Bird Watching. South Africa provides an exquisite habitat for a variety of colourful birds. Spectacular bird watching can be experienced almost anywhere in the country. One location that’s great bird watching is the Cumberland Bird Sanctuary. The sanctuary boasts an incredible bird life, over 80 different species, particularly well-known known for the pair of black Sparrow-Hawks that breed in the sanctuary. In the middle of Cumberland Bird Sanctuary is a little dam. There is also a picnic spot with tables and benches. Take your hot chocolate or coffee along with you. 4. Something for curious kids. Children are naturally curious and creative. By encouraging more outdoor play you will encourage more physical activity. The Delta Park is the home of the Delta Environmental Centre, where a wide range of fascinating wildlife related courses are offered to adults and children. This includes holiday programmes for children between the ages of six and 13. The courses are facilitated by professional staff. Take the kids to Hyundai Sky Park. This park is great for kids because it is well equipped with an interactive children’s play area, but if you want them to kick a ball or run around, take them to Innesfree Park. Located in busy Sandton, the park boasts lush green lawns and leafy trees. 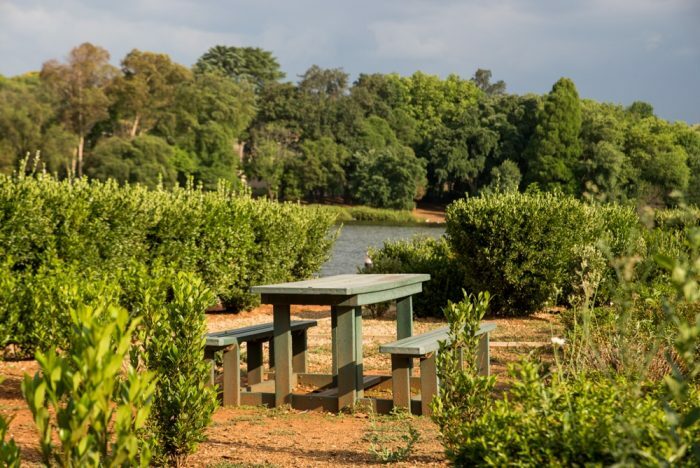 The park boasts two tranquil dams and plenty of open space for picnics. Due to its size, Innesfree Park often hosts large-scale events. 5. Take a bicycle ride. Take family or friends out on a bicycle ride around Zoo Lake. Zoo Lake is a favourite for many of Joburg’s residents. It also boasts the Coronation Fountain and is a popular spot for walking your dog and enjoying a meal at one of the restaurants or pubs. 6. Get in touch with nature. Despite a busy life, slow down and take the time to enjoy and appreciate the outdoors this winter. Visit Sandton Central Park. This park is small, intimate and located in the heart of Sandton. It occasionally hosts live concerts and other events. The park boasts a grassed amphitheatre, sculptured garden beds, indigenous trees, solar powered lights, seating and a magnificent garden. Sandton Central Park is the ideal spot to enjoy a quick coffee and lunch. 7. Visit Joburg Zoo! The zoo is one of the most popular local attractions in Joburg, with animals from around the world including those from the Amazon Basin, the Big 5, white lions and the aquarium. Next: Imminent Administration for the Metro – What does that mean?